The BHG restaurant group (Harry’s, Sal’s, Drake’s, Malone’s, Aqua, and OBC) is known around Central Kentucky for providing high quality food and drink, particularly steaks, along with attentive service in an upscale setting. 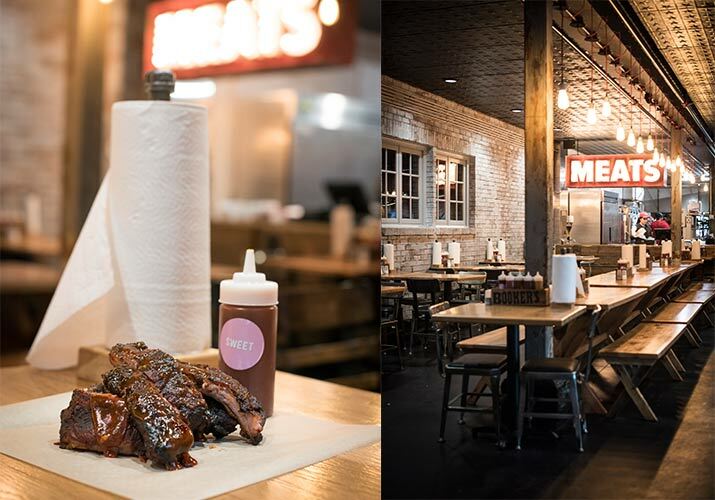 But their newest addition, MEATS BBQ MKT (3373 Tates Creek Road in the Lansdowne Shoppes) is the group’s first fast-casual dining establishment. 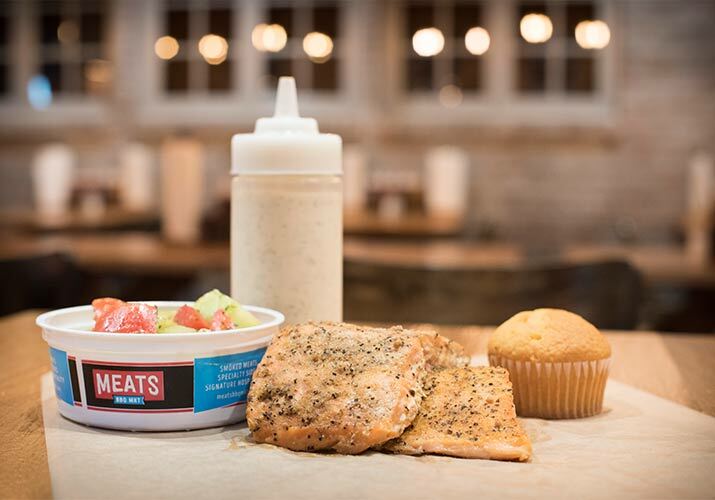 MEATS combines the best of Kentucky BBQ with a variety of homemade sauces and decadent sides. And because it’s a market as well as a restaurant, guests can also pick up freshly smoked meats by the pound, sliced to order. Upon entering, guests are greeted with a warm welcome and are ushered to the cafeteria-style ordering station, where they can sample fresh sides and dessert. The menu is truly a la carte, offering sandwiches and platters, each served with a choice of sides and a house-made jalapeno cornbread muffin. Depending on how hungry you are (or how much you want to sample) you can choose a platter with one, two, or three different kinds of meat. So what’s the meat of it? 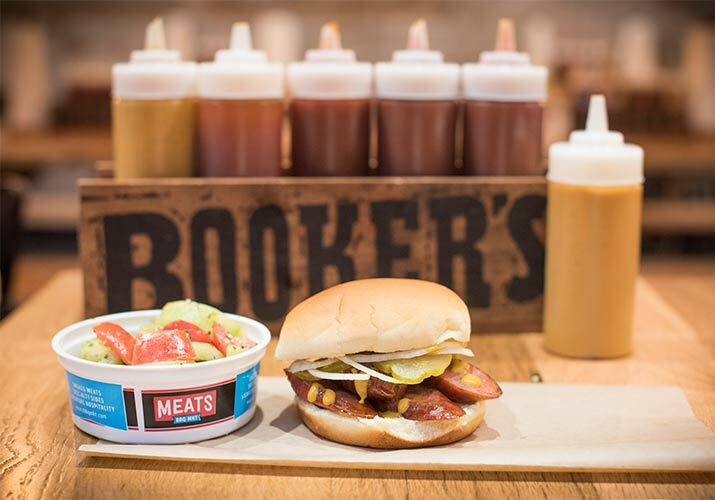 Guests can choose from the usual suspects – pulled pork, beef brisket and chicken, alongside more adventurous choices like baby back ribs and jalapeno cheddar sausage. Unlike many BBQ establishments, MEATS offers a few healthier proteins such as smoked salmon and smoked turkey. The smoked salmon is a generous portion and expertly cooked, while the smoked turkey is lean, moist and savory. True BBQ fans know that it’s all about the sauce, and MEATS does not disappoint in this area. Those who love to mix and match will appreciate the large, self-service sauce selection. Whether you prefer classic, sweet, or smoky BBQ sauces, Carolina vinegar, mustard based sauces, or even creamy mayonnaise-based sauces, you’ll find the perfect compliment to your meal. When it comes to sides, diners will find a variety of classics like mac and cheese, sweet potato casserole, green beans, baked beans, potato salad, and coleslaw. For dessert, choose from crumbly handmade apple cobbler or the banana bread pudding – an unbelievably rich, cool, and creamy treat. Catering, large to-go orders, family sizes, and party packages are also a major focal point. From a quick meal for the family after work to a tailgate with friends, there is an option for everyone. 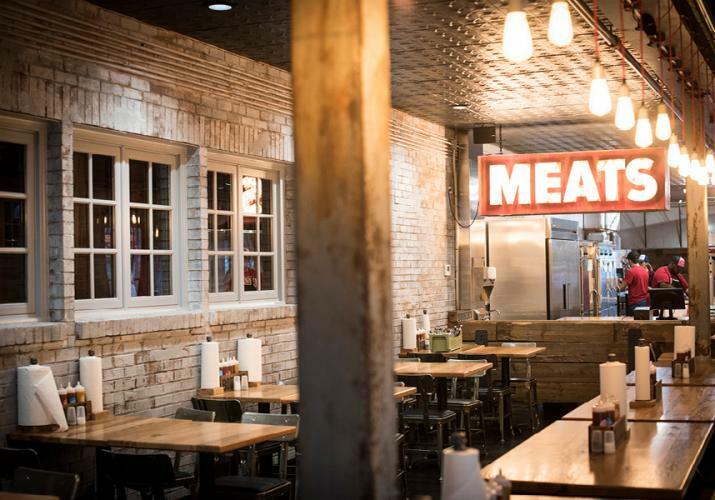 Absolutely worth checking out, MEATS BBQ MKT is a great addition to the Lansdowne area – a neighborhood meat market as well as agreat place for a quick, high-quality BBQ meal at an affordable price point. The casual self-service atmosphere and the diverse menu means that anyone can get what they want, regardless of preferences. Order off the menu, take it to-go, or pick up a few pounds of your favorite meat and whip up something at home. How old are you? I’m 43 years old, but I feel like a 25 year old! Where are you from? I’m from a little town outside Mexico City called Neza. How did you begin working in the BBQ world? I started my restaurant career with Bluegrass Hospitality Group and have been with the company for over 7 years. I was excited to get the opportunity to explore the world of BBQ when we started talking about opening MEATS. What is your favorite cut of meat? That’s a tough choice, but I love to cook with brisket and pork. What are some of the defining characteristics of Kentucky BBQ? Kentucky BBQ is unique compared to other regional BBQ cuisines because we use a variety of unique gourmet meats such as jalapeno cheddar sausage. 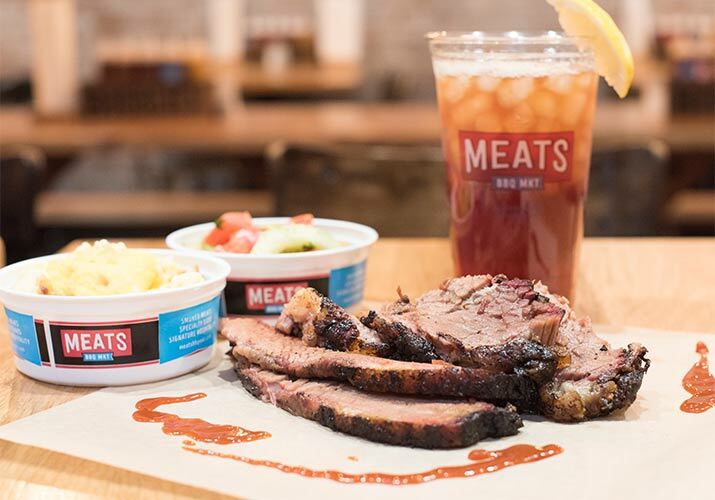 At MEATS, we’ve been able to take the best of Kentucky BBQ and combine it with other regional traditions. For example I really love our Bama White Sauce (see recipe), a mayonnaise-based BBQ sauce, because it’s something unique you usually can’t find at BBQ places in Kentucky. It’s usually found in Alabama and pairs effortlessly with our smoked salmon. Besides unique, slow-smoked cuts of meat, MEATS also serves up a variety of homemade sides. Which ones are your favorites? You can’t go wrong with any of our house made sides like coleslaw, baked beans or mac and cheese. I definitely recommend ending your meal with our banana pudding. What was your earliest food memory? I’ve been interested in food since I was very little. As I started to become familiar with different flavors and spices I started cooking for my family and friends and have loved it ever since. What kind of wood do you use in your smoker? We use hickory wood, which is traditional for Western Kentucky BBQ. Can you offer any advice or tips for at-home BBQ cooks? BBQ isn’t something you can rush, so keep it low and slow. Making sure your heat is at a consistently low temperature will ensure maximum flavor. I also always tell people to cook with love. This may sound weird, but I always think about the people I’m cooking for and how much they’re going to enjoy it and I think that makes your food taste better! What motivates you to be a better pit master? I’m motivated both by our guests and by my team members. I always want to make sure they’re taken care of, and that makes me want to work harder. What are some of your favorite BBQ restaurants in the country? Are there any that inspired the MEATS concept? We were inspired by great BBQ spots all over the country, from Moonlite in Owensboro, Kentucky to Franklin Barbecue in Austin, Texas. What would surprise people to know about you? I started out my career as a dishwasher at Regatta, one of BHG’s first restaurants. I worked my way up to a prep cook and then started cooking on the line before becoming the Pit Master of MEATS! What do you enjoy doing on your time off? I spend my days off enjoying time with my family. 1. In a medium stainless steel bowl mix all the ingredients together until well blended. 2. Pour into a container and keep refrigerated until ready to use.